Two year ago, I was involved in a project for a luxury company, and previous project manager used Scrum to manage it and the deliveries. 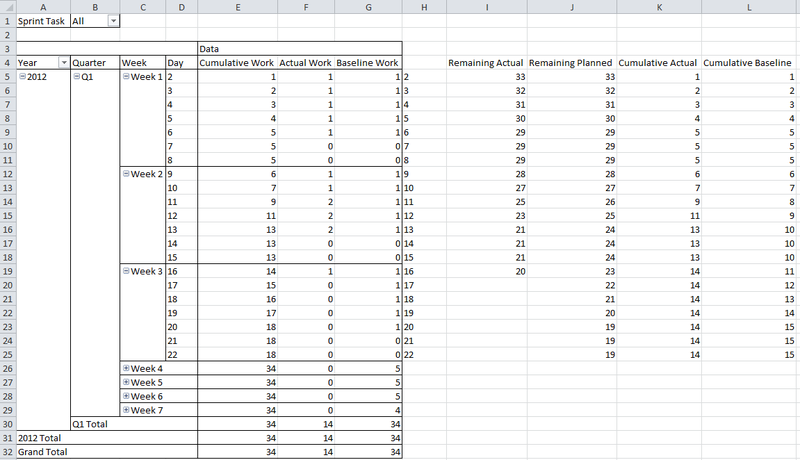 After a quick introduction of this methodology, we used his tools (mainly Excel) to implement Scrum. Today I would like to reuse Scrum in another project, but I wanted to see if it’s possible to use Microsoft Project instead of Excel to manage Scrum artifacts as Product backlog, Sprint Backlog and Burn down chart. Note that this article will not explain the methodology; you can check this article in Wikipedia or watch this interesting video by Hamid Shojaee for a quick course on Scrum. Looking at Wikipedia article I read: “The product backlog is a high-level list (of features)”. This is basically what Microsoft Project does with tasks list. Then “The product backlog contains rough estimates of both business value and development effort”. This can be achieved by adding some custom fields and display existing ones. · Sprint (Custom text or number, must be a lookup), see below how to create a lookup. As you can see, on note mouse over, I see the task description (note). We can also add this field as a column to display it in the table. To display stories based on sprint, I just create a custom Group by (Group by Sprint). This will be my sprint(s) backlog. Now it’s time to create the burn down chart. First of all I will input some actuals in my planning and update it. Note that the status date has been set to 16/01/2012 (I am a little bit ahead of schedule). Then click on Visual Reports. 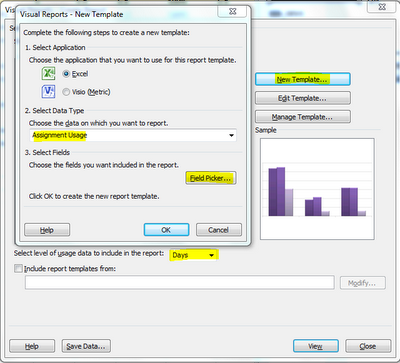 Click on new template, select Excel application and Assignment usage as Data Type. You also need to add to your report custom fields you have created. 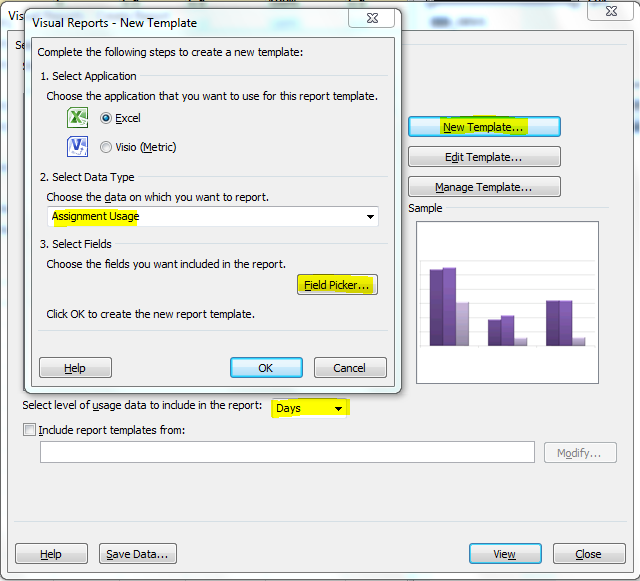 Click on Field Picker and select the Sprint (Text 2) field; this can be used to filter data. 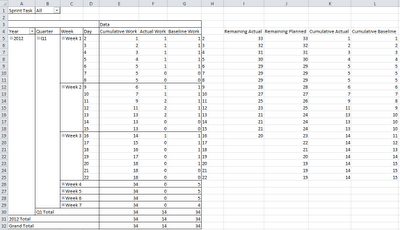 Let’s use days as Level of usage data to include in the report (Note you can use weeks or any other time frame). Important note: To be exported as a dimension, the custom field should be a lookup. This is why we have defined Sprint custom field as a lookup. This will be used to draw you burn down chart. Select the first 3 columns and insert a 2D line chart. You have now your burn down chart. Yellow tag when remaining work is not moving is simply week ends. As you can see at the end of the graph, on Jan 16th we are ahead of schedule. NOTE that of course this report can be saved as a template for future use. When saving your file, you will be prompted for that. There is always a simpler solution for lazy project managersJ. You can download the Microsoft Project 2010 Scrum Solution Starter. You can download this free package (under MICROSOFT PUBLIC LICENSE) on MSDN website. You can check the overview document under download section for a quick “how to guide”. I did not use it yet in a real project, but will try and will not miss to write on my experience. This is really great article and very well explained. Thanks Bobby for this information. Less than 25$ i think this is something maybe users should try. Hey thanks for the post its good idea to use scrum training methodlogy in microsoft project. Your posts are good and so informative. Microsoft Office Word and Excel have their own distinct advantages.